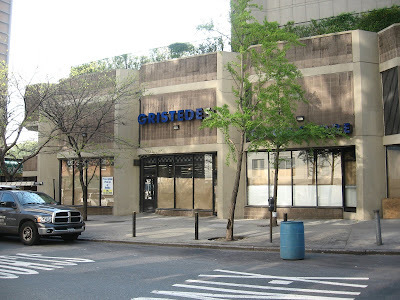 The reopening date of the Gristedes supermarket in Brooklyn Heights -- closed after an April 1 fire -- has been pushed back to the first week in July, according to employees working at the store Tuesday. "We're going to do it right," one man told McBrooklyn. He said that everything in the store still smelled heavily of smoke and would have to be replaced. 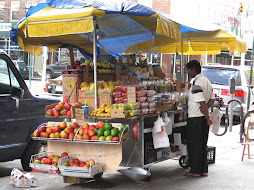 Peas n' Pickles, the deli and produce market next door, has never been busier. - Schumer Endorses Former Aide in Front of Burnt-Out Grocery Store- Fire-Damaged Brooklyn Heights Gristedes: Pharmacy To Reopen? The ex-principal of the Khalil Gibran International Academy in Brooklyn, Debbie Almontaser -- and the whole circumstances surrounding her removal from the Arabic-themed school she founded -- finally got a big story in the NY Times. The story is important not only because of Ms. Almontaser personally, but because it appears we might be witnessing the beginning of this decade's form of McCarthyism. This idea is also explored in an article in the Brooklyn Eagle, in an after-interview interview with Almontaser. Two points to Marty Markowitz on this one. He said Saturday: "There is no question that she got a raw deal. Perhaps in the days to come this will be righted.... and we hope that in days to come her vision will be realized." Surprised that Bloomberg seems to be sleepwalking through this whole thing. It's turning into one of the important issues of our time. Two really elegant bits of detail atop a building housing a hair braiding salon and a tax office on Livingston Street in Downtown Brooklyn. 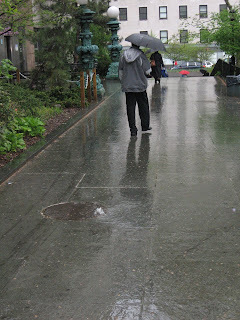 In most places in New York, when it rains the water goes down through sewers, grates and drains. 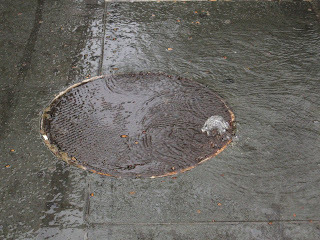 So we find it striking that the water gushes up through this manhole near Brooklyn Borough Hall whenever it even looks like rain. Not that there's anything wrong with that. We're just saying. Preliminary renderings of Lakeside Center, the new 36,000-square-foot facility including two ice skating rinks, a cafe and other amenities, were released by the Prospect Park Alliance this week, reports Gowanus Lounge, Brooklyn Eagle and others. 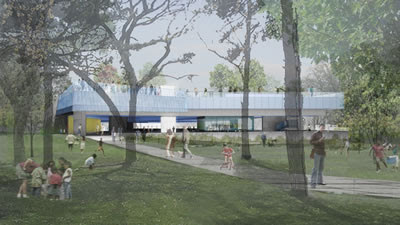 The two-level center would replace the current 60's-style Wollman Rink, while the landscaping would receive a total makeover. Next Saturday, May 3rd, at 2 p.m., Develop Don't Destroy Brooklyn, the Council of Brooklyn Neighborhoods and Brooklyn Speaks will join with community leaders and a number of elected officials to call for a "Time Out" on all Atlantic Yards activities. The rally will take place at 752 Pacific Street, between Carlton and Vanderbilt Avenues, in the heart of the "Atlantic Yards" footprint. "Recent developments in the financial markets and statements by the developer have called the entire project into question," said Terry Urban, co-chair of the Council of Brooklyn Neighborhoods. "The public benefits are in question and the only thing remaining seems to be an arena! This is not the project that was approved. Meanwhile, our neighborhoods are being blighted by unnecessary demolitions for a project that seems to be disappearing or drastically postponed. Everything needs to immediately stop while this is reviewed." Correspondent Phil Vitale notes, "Streets are already being torn up and buildings demolished at this time though it's not been officially approved." The rally would let Gov. Patterson see how concerned Brooklynites are about this project. 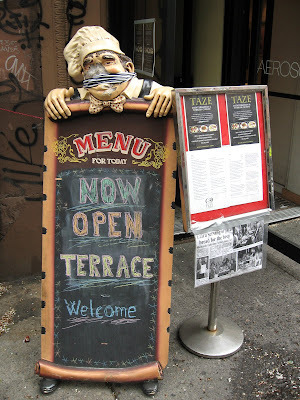 He's in bad shape, and he's hanging for dear life onto the menu board outside Taze, the Turkish restaurant at 142 Montague Street in Brooklyn Heights. Not only has he had his face bashed in but he's gagged. Wondering what to do with those old batteries, cell phones and computers? The Third Annual E-Recycling Days at the First Unitarian Chapel in Brooklyn Heights (at Pierrepont St.between Clinton and Henry Sts.) 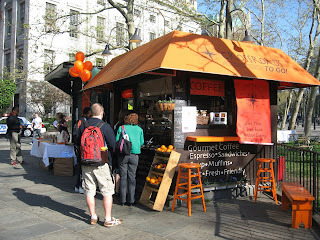 are happening on Saturday, May 3rd and Sunday, May 4th from 9AM-4PM on Saturday and Noon-2PM on Sunday. See Gowanus Lounge for details. 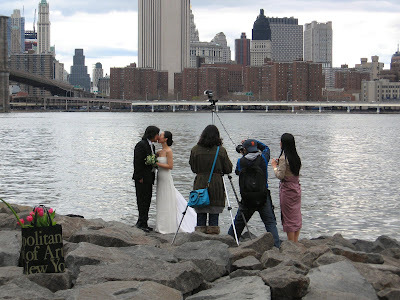 What Is This Thing on the Brooklyn Heights Promenade? 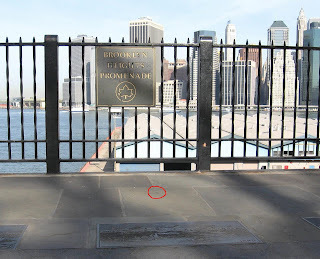 This little round thing is embedded in the Brooklyn Heights Promenade walkway, a couple of feet from the fence overlooking the BQE. It's near the Clark Street entrance. 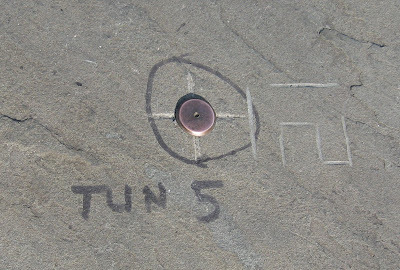 There's something similar stuck in the sidewalk across the street from the Post Office in Downtown Brooklyn. Plan to Shoot Up Brooklyn's 75th Precinct Stationhouse? After a confidential informant told police there was a plan to shoot up the 75th Precinct stationhouse on Sutter Avenue, dozens of cops were pulled off the streets Saturday, according to the NY Daily News. Officers were taken off foot patrols in East New York, and police cars blocked the route to the stationhouse in case of a drive-by shooting. It is not yet clear if these threats were related to the Sean Bell verdict. On Friday, the three police officers were acquitted of all charges, in spite of having killed Bell in a hail of bullets the night before his wedding. Rev. Al Sharpton has called for non-violent civil disobedience to protest the acquittals. In the latest, a teenage girl was struck by a car in Marine Park. This is where a woman was killed on Adams Street at lunchtime yesterday, right across the street from the new Brooklyn Marriott extension. This photo was taken several hours after she was killed; you wouldn't know anything had even happened except that a lot of yellow caution tape was in the garbage can at the bus stop. The man at the hot dog stand near the Marriott said he didn't see the accident but he heard it. "It was terrible," he said. 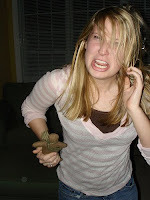 "I heard her scream, maybe two seconds. Then nothing." 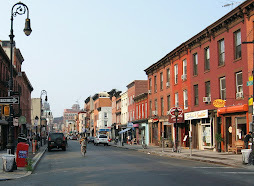 The Brooklyn Eagle reports that the woman was 69 years old and lived on Pierrepont Street in Brooklyn Heights. She appears to have been crossing at the light, though she was thrown maybe 25 feet. The Eagle has photos taken at the scene. This is less than a block away from where Judge Bookson was struck and killed, and a block away from one of the most dangerous intersections in New York City, Adams and Tillary Streets. Teacher Ron Mortensen was killed at this intersection a year ago April 13, and a large number of accidents regularly take place all along Adams. Many schools -- including Brooklyn Friends, Brooklyn Law School, City Tech, Polytechnic University, and two new public schools slated to open next September -- lie within a three-block radius. 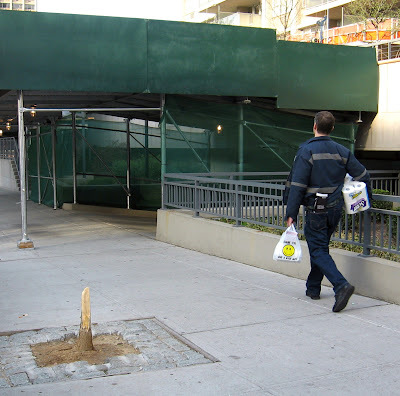 In 2006 there was a drive to create an Adams Street overhead pedestrian overpass. At that time a local mom was quoted as saying, “An upper-schooler was hit in September, 2005; two middle-schoolers were hit in April 2005 and January 2006; and [our school's] head of Security was hit on May 1." The overpass idea never got anywhere. Maybe it's time to look into it again. 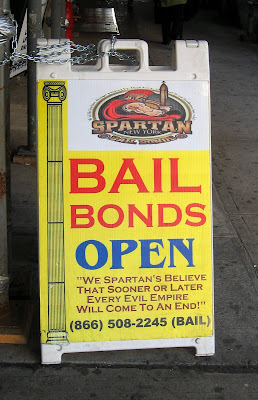 Sign on Livingston Street, Downtown Brooklyn. It must make sense to the patrons of this business. 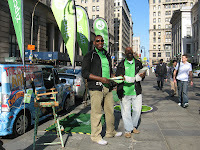 Till ten this morning the Zipcar Guys are partnering with Crossroads Cafe (that cute little coffee stand on Joralemon Street across from the Municipal Building) and giving away free coffee. 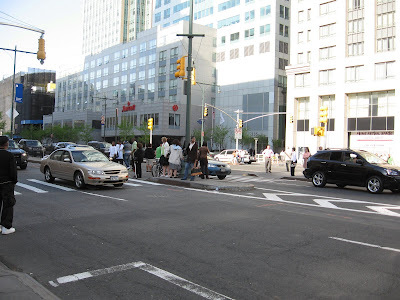 Walked down Willoughby Street lately? 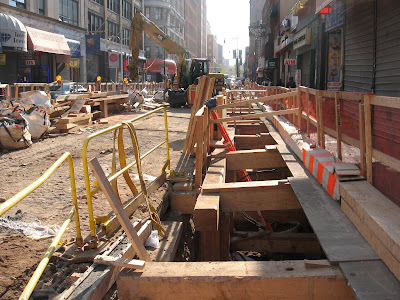 Construction of the longed-for pedestrian tunnel between the R/M trains’ Lawrence Street station and the A/C/F trains’ Jay Street station has been going on since July, but recently it's had a major impact on the western end of Willoughby Street, as can be seen in the above photo. 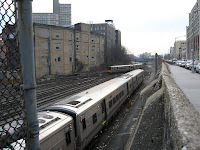 The transfer tunnel under Willoughby Street will probably attract more riders to the Lawrence Street and Jay Street stations, which combined handle roughly 35,000 passengers per week, according to the Brooklyn Eagle. This attractive 38-story condo going up at 150 Myrtle and Flatbush -- the Toren -- (that's the Oro in the background) is really something. The builders are aiming for silver-LEED (eco-friendly) certification, and residents will enjoy a multi-level rooftop garden, fitness center with a swimming pool, and high-end appliances. Brownstoner reports that Toren will feature 240 market rate condos and 40 below-market rate condos (and The New York Times reported that 10,000 people entered the lottery to buy those units). 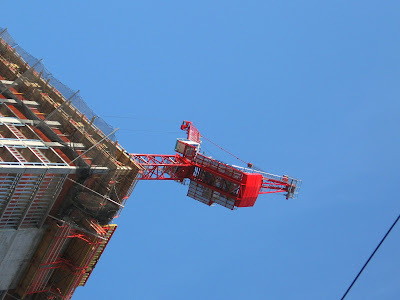 Even the unions are aiming high with the Toren. 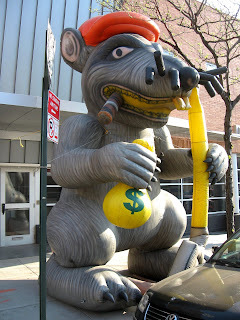 They dusted off their extra-special rat -- the one with the whiskery nose and stinky cigar -- to protest the non-union labor situation. Don't like teenagers? Wish they would just ... go away? A device called the Mosquito, which emits a high-pitched whine that only teens can hear, is being installed outside buildings, in shopping malls and in parks to drive away the young. The Compound Security Systems website says: "... the device was first used at a Spar shop in Barry, South Wales, where the owner Robert Gough was enthusiastic about the device's success in driving away the local youths. 'Either someone has come along and wiped them off the face of the earth, or it's working' he is quoted as saying." Compound Security markets the Mosquito to those whose business is "suffering from antisocial youths ... generally causing damage or nuisance." It asks: "Are you bothered by crowds of teenagers hanging around your street and making life unpleasant?" According to an AP story published on Huffington Post, almost 1,000 units have been sold in the U.S. and Canada. The device is sold under the name of "Kids Be Gone." 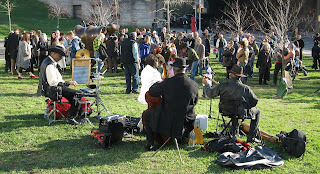 The NY Post tried out the Mosquito in Washington Square Park and Midtown. "It's obnoxious, high-pitched and painful," said one 19-year-old. UPDATE: Can't hear the 15khz whine in the above audio/video? You may not be losing your hearing -- yet. Eli Janney, Boerum Hill audio engineer (visit his site: www.elijanney.com) said he "panicked a bit" when he couldn't hear the tone: "A audio engineer who can't hear 15khz would quickly be out of a job!" Eli says: "I researched a bit and found out that Youtube audio is compressed down to 22khz sampling rate, which mean the highest possible frequency is 11khz, as long as there is no errors at all (which there always are). So with that sample from Youtube, NO ONE will be able to hear the higher frequencies since they won't be transmitted!" 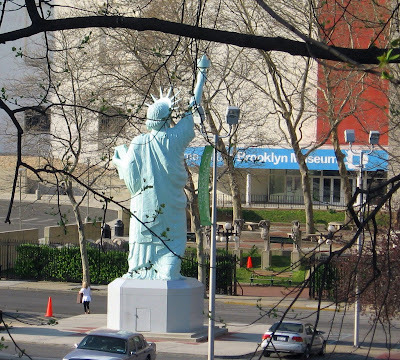 One of the more unusual pieces in the Brooklyn Museum's collection of outdoor sculpture and architectural fragments currently on exhibit is this "Lady Liberty," a thirty-foot replica of the original Statue of Liberty. 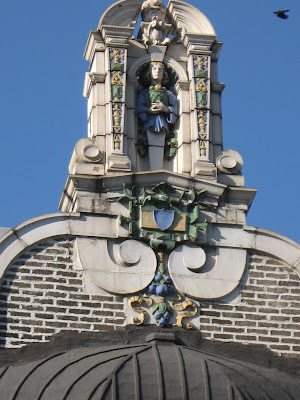 This replica was commissioned about 1900 by the Russian-born William H. Flattau to sit at the summit of his eight-story Liberty Warehouse on West 64th Street. 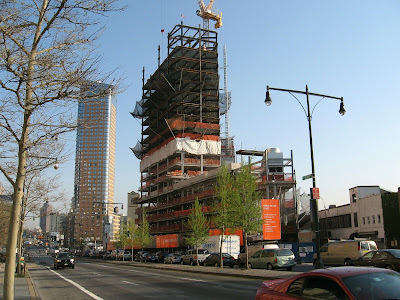 At the time, this was one of the highest points on Manhattan's Upper West Side, according to the Brooklyn Museum. Until 1912, visitors could walk up an interior staircase (see the little door in the base?) to enjoy a view of Columbus Circle from an opening in the statue's head. 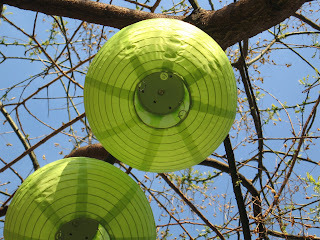 Trees along Montague Street were decorated yesterday (Earth Day) with "eco-friendly solar-powered lights." 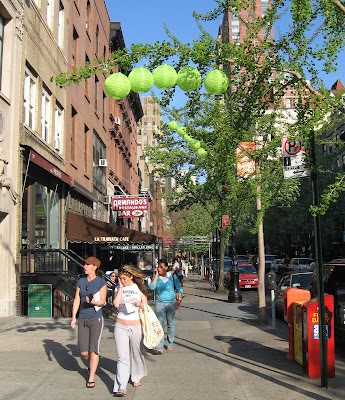 The installation, called Spring Lights, was sponsored by the Montague Street Business Improvement District. We're looking forward to seeing how much light they give off in the dark. 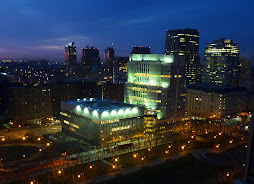 UPDATE: The Brooklyn Heights Blog has a nighttime photo here. 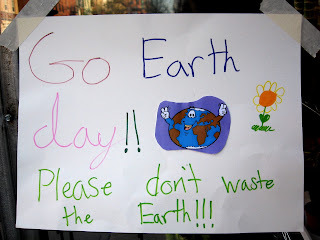 Sign on a window on Court Street in Cobble Hill. Dental Nightmare, and More Brooklyn in Brief, Tuesday P.M.
- City councilman Erik Dilan has funneled more than $180,000 in taxpayer money into a small Bushwick nonprofit run by his wife, the Daily News says. - Joe Chan, head of the Downtown Brooklyn Partnership, has a nice writeup on Crain NY's "40 Under 40." - Polytechnic University is already reaping the benefits of the planned merger with New York University through increased enrollment and accelerated global expansion, Polytechnic’s president Jerry Hultin told Crain's NY. 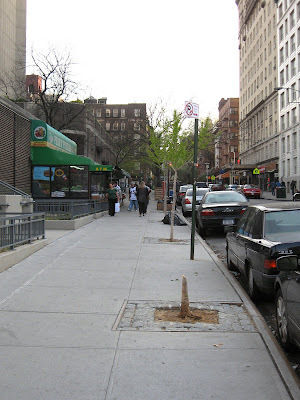 Remember what a rukus there was more than two years ago when five 40-year-old shade trees were cut down in front of 75 Henry Street in Brooklyn Heights? 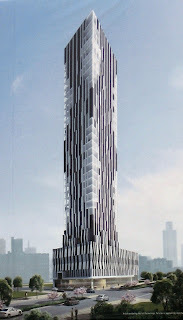 The board of the 32-story tower was “appalled” and blamed the Park's Department's Forestry Division. Some tenants blamed the building's contractor, York Restoration Corp., which was doing work on the sidewalk. 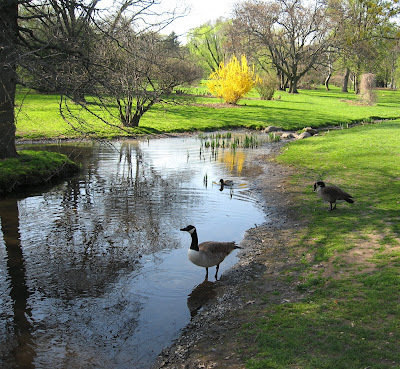 York blamed the Parks Department. 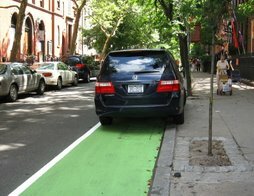 The Brooklyn Heights Association sided with the Forestry Division. After the finger-pointing subsided, the co-op planted new trees -- ginkgos -- and, while not as majestic as the originals, they've been coming along nicely. Until now. Somehow -- most likely yesterday -- one of the newly planted trees was decapitated, leaving only a pathetic stump. Who did it this time? The new contractor, working on the exterior walls? The scaffolding company? The Parks Department? (Okay, not likely.) Some drunken truck driver? We were a bit confused when we saw this glittery little statuette at Fortune House restaurant on Henry Street in Brooklyn Heights. 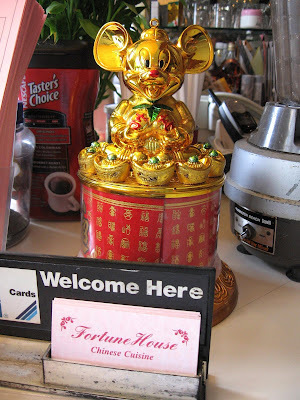 When we asked the woman behind the counter why they had a golden Chinese Mickey Mouse, she told us, "It's the Year of the Mouse." Developer David Walentas has won permission to finish his Atlantic Avenue apartment building with"possible" rooftop cabanas, according to the Brooklyn Paper," despite an ongoing controversy that the cabanas break the 50-foot height limit in historic Cobble Hill. 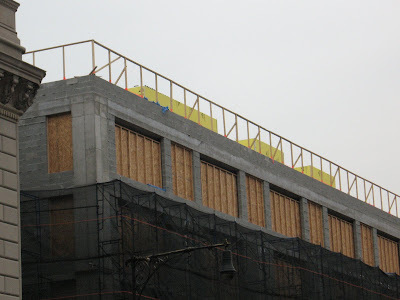 McBrooklyn got this photo of the boxlike rooftop structures (yellow) at the end of March, before black shrouding was placed over them. 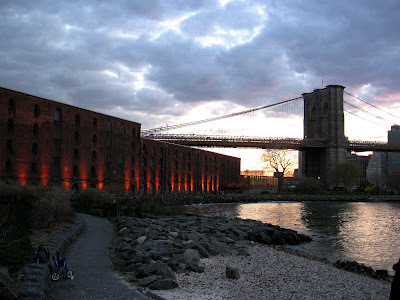 “Everything has been approved by the Department of Buildings and the Landmarks Preservation Commission,” Jed Walentas told the Brooklyn Paper, and both city agencies confirmed Walentas’s opinion. Back in March, City Council Member Bill de Blasio’s office said that if the cabanas were not in the design approved by LPC and the Council, they would have to come down, according to the Brooklyn Eagle. The historic district law allows "mechanical bulkheads" only -- not residential -- above the 50-foot limit. So what gives? 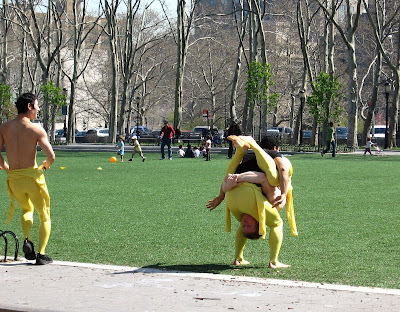 The dance/contortionist troupe Pilobolus (named after a "sun-loving fungus that lives in cow dung") was in Cadman Plaza Park in Brooklyn Heights Friday, preparing to shoot a segment for Sesame Street. McBrooklyn stumbled across members of this incredibly fit group of humans warming up for their roles as the letter "L," the number "4," and the words "octagon," "stuck," "unanimous" and "insert." A member of the troupe told us they were going to shoot some letters in Manhattan, as well. Pilobolus, called "human Legos" and "human clay," performed to great acclaim at the 79 Oscar ceremony (with Ellen Degeneres). Below is a video of the work they did for a Hyundai ad. Peace and tranquility at the Brooklyn Botanic Garden. Don't forget, Sakura Matsuri, the Cherry Blossom Festival, takes place May 3 and 4. Here's the official poster for the Third Annual Brooklyn Blogfest, the storied gathering of Brooklyn bloggers. It was founded and is organized by Louise Crawford of Only the Blog Knows Brooklyn. Soaking up some rays on the War Memorial in Cadman Plaza Park, Brooklyn Heights. According to the Voz Iz Neias blog, the NYPD Intelligence Division are investigating a threatening letter against the Pope that was allegedly found on the door of a house in the Borough Park section of Brooklyn. Not confirmed, but a comment appears to back up this story. MeanRed Productions sent us this MoveOn video that makes this point: Whatever happens in Iraq, the Bush administration and John McCain always have the answer: six more months. FreshDirect trucks are usually big diesel jobbies. 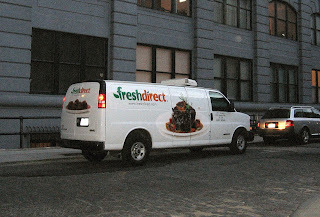 So we were surprised to see this diminutive FreshDirect van parked down in Dumbo the other day. We can't find any mention of this switch to vans anywhere, though Biodiesel Magazine says that FreshDirect has switched to biodiesel. We're not Fresh Direct customers -- anybody know if this is a common mode of delivery for FD? - The city’s Department of Housing Preservation and Development announced the selection of the team chosen to design and construct green development at “Public Place,” a six-acre site alongside the Gowanus Canal. 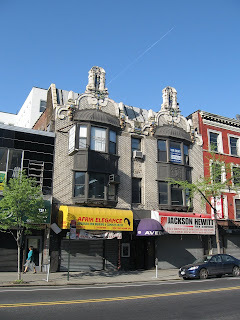 Crains NY, Brooklyn Eagle, Curbed and Brownstoner. - Rabbi Yehuda Kolko, a Brooklyn yeshiva teacher charged with sexually molesting his students, copped a plea and was sentenced to three years’ probation. Now the Jewish Week News wonders if Brooklyn DA Hynes lacks the political will to pursue allegations of wrongdoing involving Brooklyn’s politically powerful Orthodox community. - Racked shows a rendering of what the empty retail space in the spectacular lobby of One Hanson Place near BAM might look like if/when it is leased. It's amazing that so few people come down to the "beach" in Dumbo at this time of evening. It's such a peaceful respite after a harried day. 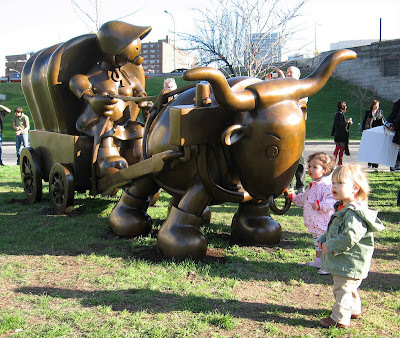 Otterness 'Large Covered Wagon' Feted in Dumbo; Now Can We Get Back to Our Lives? 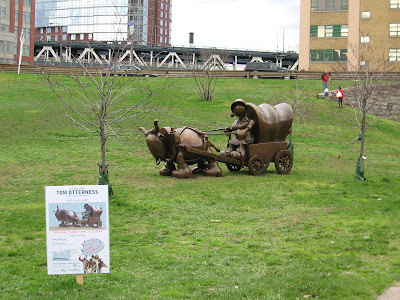 After much discussion, Tom Otterness' bronze sculpture "Large Covered Wagon" was officially celebrated in Dumbo yesterday afternoon. The Ebony Hillbillies put out a great bluegrass sound, the weather was sunny and a nice-size crowd turned up toting cameras and kids. Tom Otterness mingled with people and spoke to reporters. 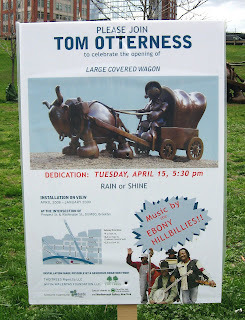 A few people with dogs showed up, but they seemed to have no idea of the Otterness-dog controversy. Everyone we spoke to said they were Otterness fans. 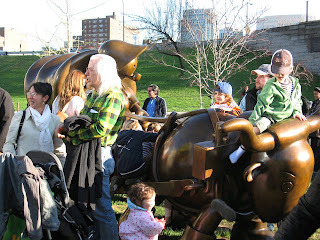 Parents put their children up on the back of the giant bronze ox pulling the wagon and took their picture. 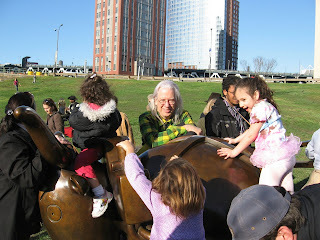 They shook Otterness' hand (he's wearing the green checkered shirt) and he posed with them. 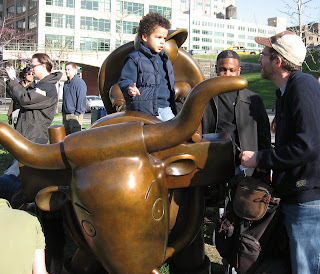 A reporter from the Brooklyn Eagle interviewed a small, cute boy sitting on the back of the bronze ox. Then the Brooklyn Paper's Gersh Kuntzman (photo, right) showed up and interviewed the same boy, who was still sitting on the back of the ox. Several people with commercial video rigs also taped him. After the celebration, some of the attendees and a select few members of the media were invited to the Walentas' 15-story Dumbo penthouse for a private reception with Otterness after the event. Needless to say, McBrooklyn was not invited. This will be a nice one for the wedding album. The bride is quite game. She had to scramble out over the rocks (most likely wearing some pointy little shoes) for this picturesque shot. Everyone else was wearing warm clothing -- note the spectator on the shoreline below -- except for her. U.S. 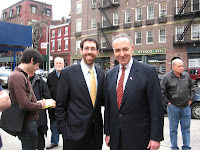 Senator Chuck Schumer endorsed former aid Daniel Squadron for the Democratic nomination for state senator, 25th District, this past Sunday. The event drew a small crowd in front of the burnt-out Gristedes grocery store, on Henry and Clark Streets in Brooklyn Heights -- a curious site, but quite convenient. The significance of this endorsement, according to the Brooklyn Eagle, is that the seat has continuously been held by State Sen. Marty Connor since 1978. Schumer cited “complete integrity” and the political experience gained from being his assistant as Squadron’s qualification for the post, according to the Eagle. Marty Algaze, a spokesman for Connor, had a different opinion of Squadron: “His resume is about as deep as a paper clip." It's a grand sculpture installed over the weekend on Washington Street at Prospect, and we'd really like to feel more positive about it. The dog thing has changed our whole perception of the artist and this event.